Welcome to Jane Prophet’s project that explores brain activity during the contemplation of artworks and death. Can contemporary neuroscience and new imaging technologies increase our understanding of consciousness? When we look at memento mori artworks are we prompted to contemplate our own mortality? What parts of the brain are active when we look at these artworks? In 1986 I was in my second year at art school when the British photographer, Jo Spence, published the book “Putting myself in the picture”. Spence’s critical documentary practice was a feminist critique of representation and it was an inspiration. In one of the final images in this book she captions one of her photographs with “Someday my prints will come”. For me, maybe as for Spence, art is the prince on the white charger. I wait for delivery of 3D prints, much as she waited for her silver-based photographs to arrive. When I saw this timelapse of one of the sections my Neuro Memento Mori piece being printed, I immediately thought of Spence, her witty “Someday my prints will come” and her series ‘The Final Project’, made with her long term collaborator, Terry Dennett. 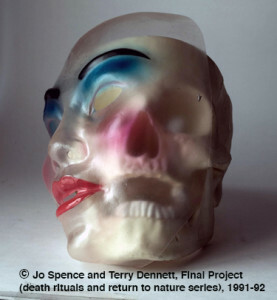 In the last two years of her life, 1991-1992, she made these memento mori works as she thought about her death. One photograph in particular strikes me. The face is a mask with empty eyes, a double exposure that seems to catch a moment of slippage, where the face pitches to one side, revealing the skull beneath. The skull. Always there, the hidden scaffold for our lively expression that remains after our eyes empty and our flesh rots. Next week Art Basel Hong Kong begins. A good time to “Remember You Must Die” to think about the transience of life and art, its futility. To remember, and celebrate, art’s pointlessness and the inevitable but useless joy of anticipation. Someday my dark prince/prints of death will come. The gold at the end of rainbow coloured brain maps. Are we seduced by neuroimages? Are we seduced by rainbow coloured images of human brains? Do we think that neuroscientific explanations are ‘gold’? 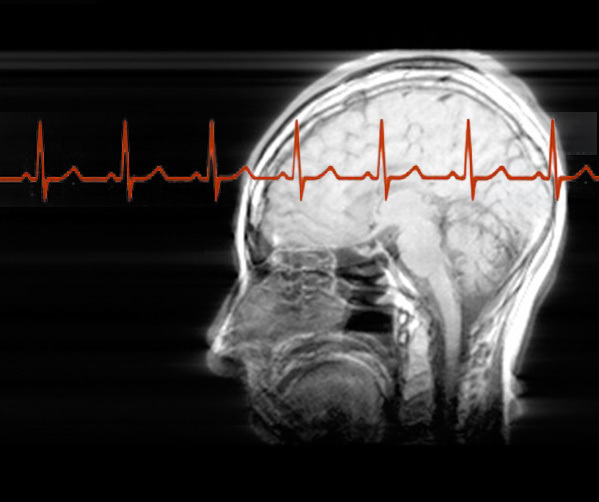 As new neuroscientific instruments such as MRI and EEG have made it possible to safely image living human brains, there has been a concurrent significant increase in data from neuroscientific research, in particular neuroimaging, and a proliferation of the use of brightly coloured neuroimages in the popular press. Scholars of rhetoric have problematised the ‘seductive allure’ of both neuroscientific explanations (Weisberg et al. 2008). Psychologist, Deena Skolnick Weisberg found that non experts judged that explanations with logically irrelevant neuroscience information were more satisfying than explanations without neuroscience information. In other words, they claim that to non experts (most of us) neuroscientific explanations for human behaviour are more convincing than explanations that do not refer to neuroscience. Against this background, a better understanding of neuroimages, which are referred to repeatedly in the debates and practices of neuroscience, became important for the realisation of my artwork. This is because neuroimages are central to the way that Neuro Memento Mori because is produced. When I make art as a result of neuroscience experiments, is the art work seductive or compelling because it relates to neuroscientific explanations about brain activity? If so, who finds it seductive? What is the impact of using neuroimages to make the art works? What kind of neuroimages might I use and what do they mean? 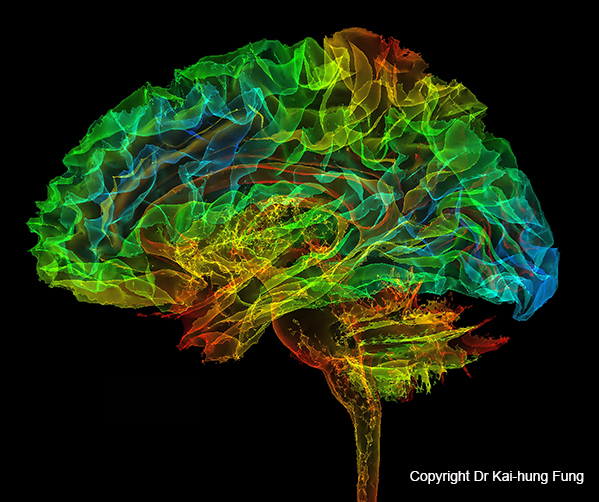 The image above is from my brain data, made by a radiologist and artist, Dr Kai-Hung Fung. His processing of my MRI data results in a highly coloured ‘seductive’ image. How do these images fit into debates within contemporary art that problematise beauty in art? More on that soon. Critical cartographers, like Amy D. Propen suggests that we engage with a map “as something that both socially constructed and as purporting to represent a “correct” model of the physical world” by understanding cartographic practice as embodied knowledge. This seems especially relevant when engaging in neuro cartography, or mapping the brain, as this practice – the production of neuroimages – depends on living, embodied, brains. To get the clearest neuroimages my body and brain need to remain very still for the 5-10 minutes that a functional MRI scan takes to complete. This need for stillness makes me self-conscious and that accentuates my sense of being embodied. As I try to control my body and stay still, I become hyper aware of what are usually unconscious and small bodily movements associated with breathing or swallowing. To move while being scanned adds noise to the data, blurring the image, and therefore the most scientifically useful MRI image emerges through intra-actions that partially erase the trace of my body. ‘Playing dead’ is an essential part of imaging my living brain. For more see Amy Propen, “Cartographic Representation and the Construction of Lived Worlds: Understanding Cartographic Practice as Embodied Knowledge.” Rethinking Maps. Ed. Martin Dodge, Rob Kitchin, and Chris Perkins. New York: Routledge, 2009. 113-130. See also, Joseph P. Hornak’s online book, “The Basics of MRI” online. Since I was a small child I’ve been known as a fidget. So when I was told I had to be very still for a series of seven minute MRI scans I was worried. I was a kid who, when bad dreams sent me running to my parents’ bedroom, kept my mum awake all night as I kicked and wriggled while ‘peacefully’ asleep. That’s the kid that grew into a woman who nightly and tosses and turns. How could I possibly stay still in the scanner? Let along REALLY still. Not even swallowing… Ironically, given the experiments we performed, I needed to still my body, to ‘play dead’ in order to prevent micro movements. We are usually unaware of how many small movements that we make when we think we are being ‘still’. 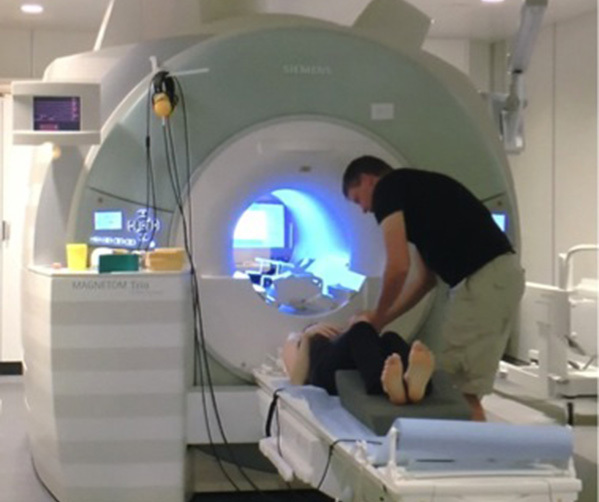 But in the MRI scanner these micro movements “due to swallowing, fidgeting, overt speech, or transmitted motion as a result of finger pressing on a keypad are a major cause of inconclusive or uninterpretable fMRI results in the clinical setting”. (Desmond et al. 2002). So, my body and brain need to be very still for the 5-10 minutes that a functional MRI scan takes to complete. This stillness created a self-consciousness that accentuated my sense of being embodied. I’d first noticed this during mindfulness meditation, the more mindful I became, the more ‘bodiful’ I realized I was. As I quieten my mind, my awareness is more open to, and often overwhelmed by the sensations in my body. Little aches and pains, the feels of the surface I am lying on, the temperature of the air as it fills my lungs, all these sensations flood in. As I practiced, knowing I would have to lie very still and not even swallow in the scanner, I found myself trying to control what are usually unconscious and small bodily movements, like those associated with breathing or swallowing. As a newbie mindfulness practitioner and a wannabe MRI subject I became hyper aware of my tiny movements and that awareness became tension which resulted in ticks and twitches. My ongoing lesson is to have the awareness but not to focus on it, not to turn it into tension. I noticed in the moment of imagining resisting movement, I would make a small movement. It was a sort of mental ‘tensing’ as I thought of wanting to move, and then tried to stop that thought, right then my muscles would alter as I imagined ‘not moving’. This project is full of surprises, it’s made me know more about myself and taught me new things. But one of the biggest surprises was when I came out of the MRI scanner and the neuroscientist, Torben, commented on how still I’d been. I was stunned (and proud of myself). After 50 years of fidgeting and being told off for it, I am learning to stay still! Desmond, John E, and Annabel S. H. Chen. “Ethical issues in the clinical application of fMRI: factors affecting the validity and interpretation of activations.” Brain and cognition 50, no. 3 (2002): 482-497. Neuroscientific research is one of a series of scientific endeavors, including stem cell research and space exploration, that have been described as ‘pioneering’. I’ve become interested in why we keep on seeing the use of this term. Scholars of rhetoric, like Leah Ceccarelli have argued that the use of pioneer metaphors is an important part of arguing for large-scale funding of some scientific research (Ceccarelli 2013). I’ve been thinking about the relationship between contemporary neuroscience and the excitement and power associated with any research that is marketed as ‘pioneering’ (Prophet, In Press). 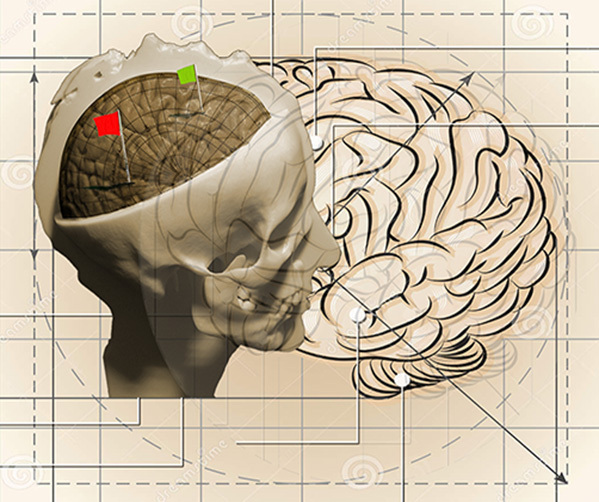 The use of terms like ‘conquest’ and ‘land grab’ in discussions of so-called pioneering science points to the relationship between the pioneer, the frontier and the map and I’m making connections between those terms from geography and mapmaking (cartography) and the making of so-called ‘brain-maps’ and related computational ‘brain atlases’. My thinking goes something like this: historically, geographic-pioneers needed cartographers in order to map out, and lay claim to, newly discovered territories, to define boundaries, to demarcate, divide and classify. This has been discussed widely as being a set of political acts. What is revealed when we think similarly about the mapping rhetoric that is being played out in neuroscience? A critical cartographer is someone who looks at maps and map-making using theoretical critique grounded in critical theory. Critical cartography differs from academic cartography in that it links geographic knowledge with political power. I’m looking at brain maps like a critical cartographer to see what they show me about neuroscientific knowledge and political power. Though ‘ashes to ashes’ is a phrase from the Anglican Book of Common Prayer burial service, the practice of burning the dead predates Christianity. The earliest recorded cremation was approx 20,000 – 26,000 years ago. In 1969 a female body was discovered in Lake Mungo (New South Wales, Australia). Mungo Lady lived around the shores of Lake Mungo. A time of plenty was coming to an end at Willandra Lakes, when the basins were full of water and teeming with life. When Mungo Lady died, her family mourned for her. Her body was cremated, the remaining bones were crushed, burned again and then buried in the growing lunette. No images are shown of Mungo Lady out of respect to the Ngiyampaa, the Mutthi Mutthi and the Paakantji and all Aboriginal people. The image here is from current tests of my projection maps. Thanks to Ivan Zhao. 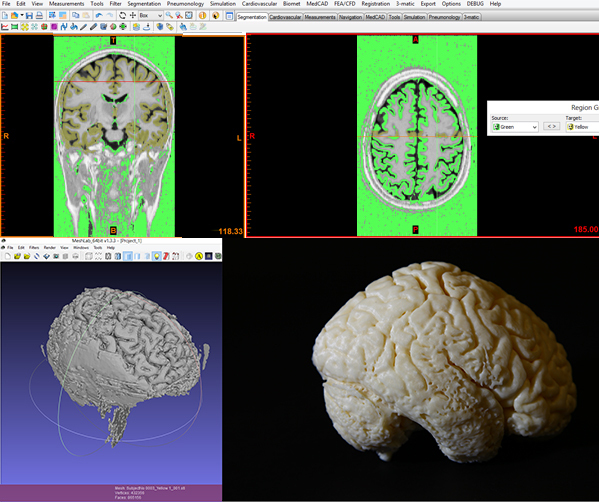 Neuroimages produced during our MRI experiments were processed to produce 3D datasets of my brain. 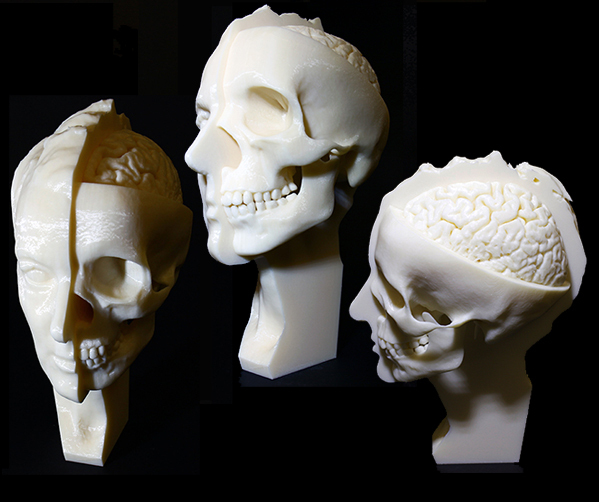 These 3D models, were then used to make a 3D printed sculptural objects. 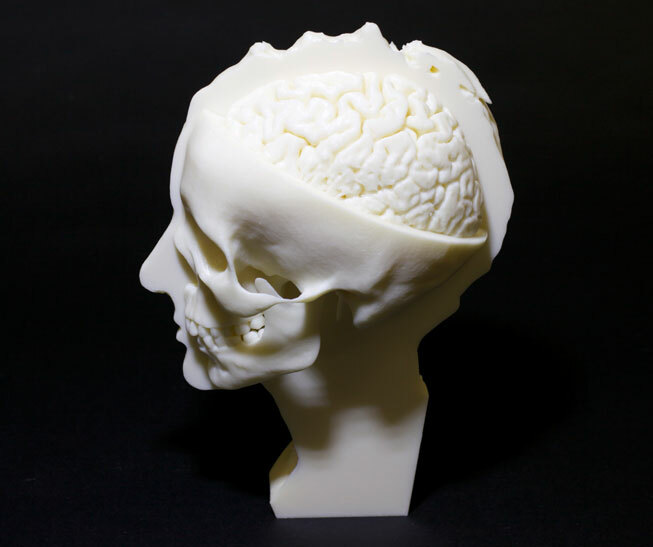 The first object we printed was of the grey matter of the artist’s brain. It felt strange to hold a 3D print of my own brain in my hand. 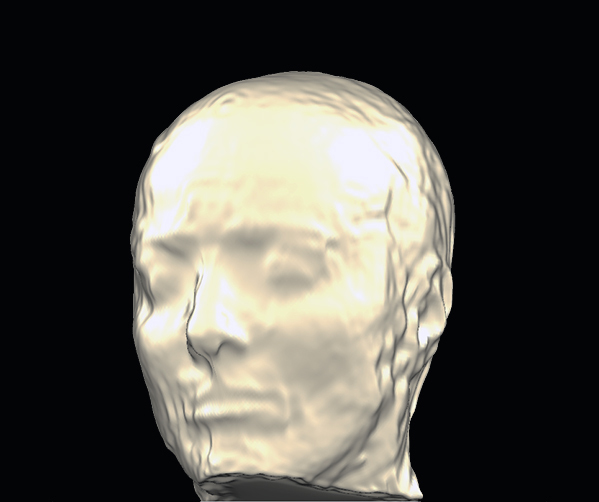 The first neuro memento mori self portrait we created combines the structural MRI of my brain with the structural 3D scans of my face, head and neck. This piece does not show brain activity but is formally similar to memento mori and vanitas works. However, it takes memento mori a step further by not only showing the skull but cutting into the skull to show the artist’s brain. The object is life-sized. It is displayed at the new Moesgaard Museum, Aarhus, Denmark as part of the ethnographic exhibition, ‘The Life of the Dead’ which runs 2014-2018. Sometimes you don’t get the data that you were expecting… When we transferred data between programs we had a 3D model like this. It reminded me of the caul found occasionally on newborn babies. The name caul or cowl (Latin: Caput galeatum, literally, “helmeted head”) is a piece of membrane that can cover a newborn’s head and face. It’s a little ghostly, somehow appropriate to a memento mori project, like one of the vanitas memento mori waxworks melting, or my face as if covered in a muslin death shroud. I’m thinking of 3D printing it as it is. It’s a happy accident, serendipity. – how much I do in my life from a sense of ‘duty’. I have let go of some events and quietly stepped back from some people already, gently, as a result of this growing understanding. – how the ego of being a contemporary artist, yearning for recognition, is a veneer on top of a joyful practice of being a creative person. At the moment of impending death the veneer is stripped away. This is a wonderful reality check and is balancing for me. Like balancing on top of a ball, this is a precarious, ever-shifting state. I often slip into insecurity or yearning and have to do some fancy foot work to regain my balance. – how the more I feel I will die, now, the less I fear it. There is still fear and struggle but I am very surprised that the sense of sheer terror diminishes relatively quickly. The image above is of an artwork I made in the 1990s called Sarcophagus, a horrible piece of work in many ways, a failure, useful to contemplate when the old ego gets boisterous.